Gian Piero Ventura has been sacked as Italy manager after overseeing a catastrophic World Cup qualifying failure. For the first time since 1958 Italy have failed to qualify for the World Cup, with a 0-0 draw against Sweden on Monday at San Siro clinching a 1-0 aggregate victory for the Swedes in their qualifying play-off. And the debacle has cost Ventura his job, as the FIGC confirmed in a statement released on Wednesday. "During a meeting called by FIGC president Carlo Tevecchio... the failure to qualify for the 2018 World Cup in Russia was discussed," the missive states. "As the first order of business Tevecchio revealed the release of the entire technical team and, from today onwards, Gian Piero Ventura is no longer coach of the national team." Ventura refused to hand in his resignation immediately following the Sweden match, saying he needed time to speak with the Italian federation president. “I didn’t resign because I haven't met [with the] Italian FA chairman yet. We’ll meet in the next days, we’ll discuss about it. There are many things to talk about," he said on Monday. But the decision has now been taken out of his hands, as he is forced out of the post after a year-and-a-half in charge. Ventura took over for Antonio Conte following Italy's successful Euro 2016 run, when they bowed out on penalties to Germany in the quarter-finals. Conte was considered to have overachieved with that Italy side, who were short on talent in comparison to Azzurri teams of the past. But Ventura failed to achieve what his predecessor had during his time at the helm, with Italy regressing in a World Cup qualifying campaign that counted a 1-1 home draw to Macedonia last month among its more disappointing results. 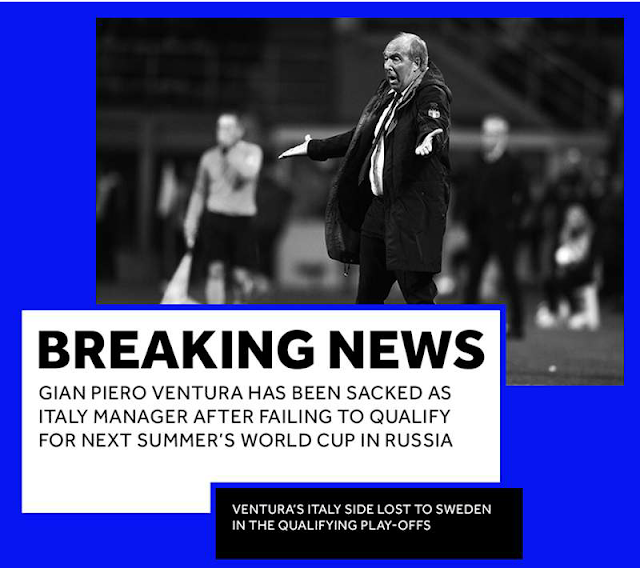 Ventura could only lead Italy to a second-place finish in UEFA World Cup qualifying Group G, finishing five points behind group winners Spain and setting up a play-off with the Swedes to reach the world cup only to loose the match thereby quashing Italy's world cup dream.